Disclosure: This Tips for Taking Care of Sensitive Skin #WMSimplyClean post is sponsored by Mirum Shopper but all opinions are my own. Please see below for additional disclosure. There is no question that those of us with sensitive skin have to be more careful than most. When it comes to skincare products, there are not a lot of products I will use unless I know for certain that they will work for my skin type. 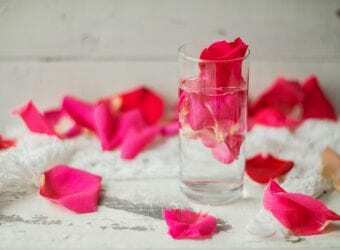 These Tips for Taking Care of Sensitive Skin will help you navigate the world of skin care products and do what is best for your sensitive skin. Choose cosmetics carefully. Make certain to test everything out before putting it on your body. Eat a balanced diet. Consider anti-inflammatory spices like turmeric, ginger, cinnamon and black pepper. Don't touch your face a lot. The things that end on your hands can end up causing issues on your face. Wash your hands any time you are about to touch your face. Use the right products. Simple products gently cleanse and remove all traces of makeup plus they leave skin hydrated, conditioned and soft. 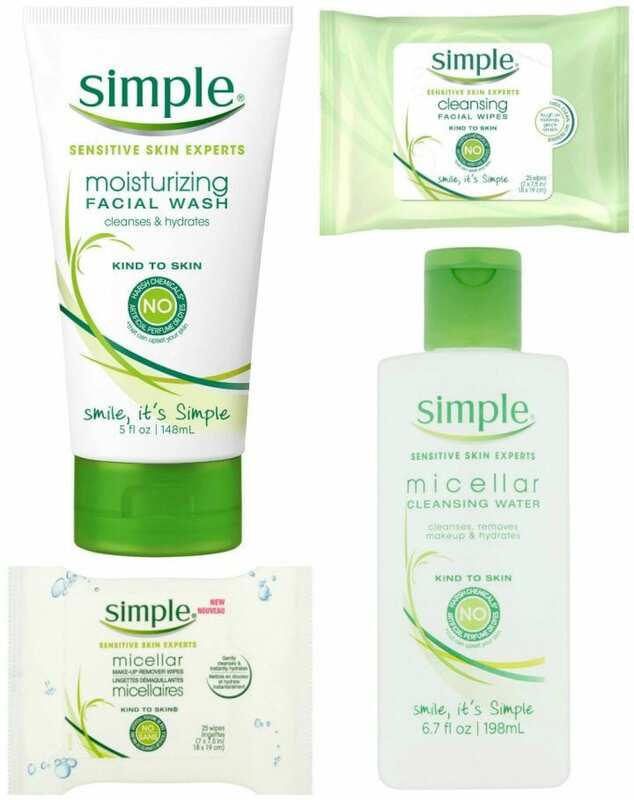 Simple Skincare is a leading brand aiding to those with sensitive skin. The brand, which originated in the UK, has been around for over 50 years creating products that never use dyes, artificial perfumes, or harsh irritants that upset your skin. Simple’s four core products help show women everywhere, who long for beautiful, healthy looking skin, that they can achieve healthy looking skin without the hassle. You can count on Simple as their quick, go-to brand for every occasion in your busy, on-the-go lifestyle. Whether that’s coming home late from work, a night out with friends, or if you just want to freshen up between events, Simple products have the right ingredients to keep your skin feeling fresh and hydrated. have no artificial/dyes color or perfumes. have no harsh chemicals that can upset your skin. offer skin-loving ingredients and multi-vitamins. HOW TO USE: For best results – gently wipe over eyelids, face, neck and even lips to cleanse the skin. HOW TO USE: For best results, gently wipe over eyelids, face, neck and even lips to cleanse the skin. Hold the wipe over stubborn areas for a few seconds before wiping. Simple Micellar Cleansing Water, 6.7oz gently lifts makeup and impurities out and instantly boosts skin’s hydration by 90% while cleansing makeup, dirt, and impurities while unclogging pores. It's made with triple purified water, hexylene glycol, and infused with vitamins B3 and C.
HOW TO USE: For best results apply a generous amount to a Q-tips Beauty Rounds. Wipe the Q-tips Beauty Rounds all around the face, no need to rub the skin. Gently wipe around closed eyes and avoid getting into your eyes. No need to rinse after! Simple Moisturizing Facial Wash, 5oz:Leaves your skin thoroughly cleansed and nourished, plus it’s a perfect blend of our purest possible skin loving ingredients with added vitamins. This formula is safe for sensitive skin and eyes. But avoid direct contact with eyes. Note: The cleanser isn’t a replacement for your moisturizer but a cleanser that offer more than just cleansing, so your skin is left with a moisturized feel. HOW TO USE: For best results wet face with warm water. Squeeze a small amount into hands and work into a lather. Massage gently in a circular motion onto wet skin. Rinse with warm water and pat dry. Avoid delicate eye area. Starting on 3/19: Buy Any Simple Skin Care product, Get Free 25ct wipes ($7.99 value). This Tips for Taking Care of Sensitive Skin #WMSimplyClean post is sponsored. 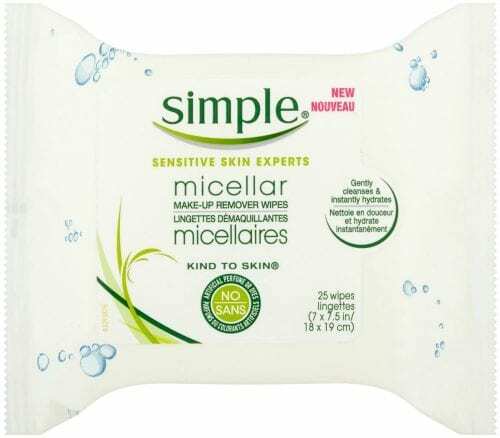 I have used the Simple brand many times and it works wonderful for me. My skin is more dry and sensitive but the stuff works the best for me. I like it a lot. I have such sensitive skin and i Have never tried this brand! I will have to pick it up. I am unhappy with what I am currently using. 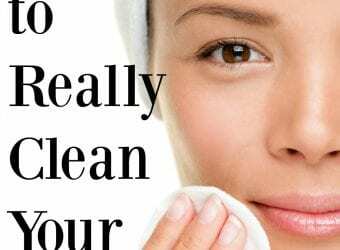 I have never tried the Simple line of products but I am always looking for that perfect cleanser that cleans, moisturizes, but doesn’t make my skin feel oily. If they are at Walmart they must be a great buy. My skin is SO sensitive am always looking for ways to NOT irritate it. I love this. Hydration is definitely key! I dropped soda two weeks and ago and have been drinking more water – I’m already noticing changes in my skin! Simple looks like a great product line for me to try. My skin is so sensitive and dry. I will have to pick up some Cleansing Wipes to try. My Daughter has really sensitive skin. I have been looking for a new product line for her to try. I will have to look for Simple when I go shopping this week. This looks like a great product line. I always have to watch what I use on my skin. 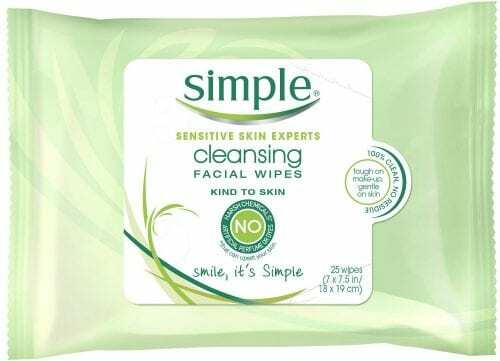 I have used Simple Facial Wipes before and I love how gentle they are on my skin. I will have to see about getting their other products as well. These are all some great tips. I have sensitive skin, and so does my youngest daughter. It’s nice to see some great products that can be useful for us. I am going to have to look into these more. My oldest daughter has very sensitive skin and nothing has been working so far. Great tips and an awesome brand. I will definitely share. Love these tips! I really appreciate that you shared this! I was looking for a good product for my skin. Will definitely try this! Great tips! Since I’m getting older, I’ve been taking care of my skin more. This product seems very good! I’ll have to give it a try! Simple sounds like a great line! We constantly battle dry skin here, so I can’t wait to give these a try. Thank you so much! I have super sensitive skin, so much so that even my dermatologist was surprised by a reaction I had. 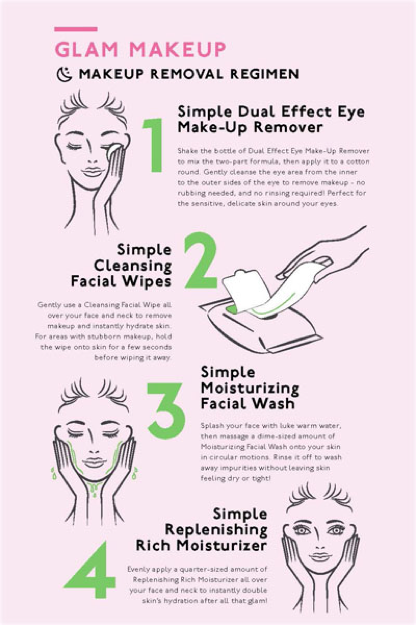 I definitely appreciate these tips and look forward to trying out Simple products! I love this! I have very dry skin, but I can’t just put on any old moisturizer. If I do, I end up with dry AND red, itchy skin. I do need to be extra careful with my skin. The facial wash and the wipe sounds like they could help me a lot. I like the safe ingredients. 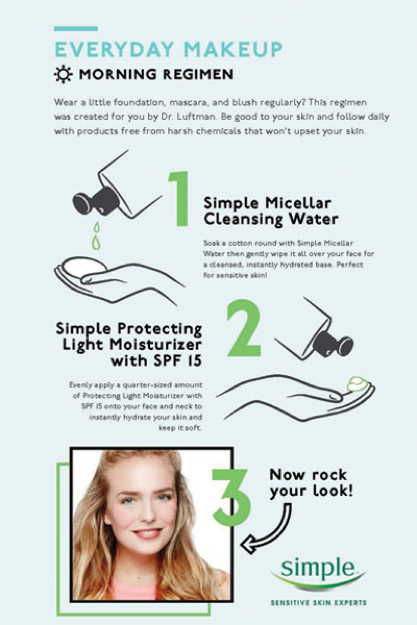 These are all great tips on how to take care of sensitive skin, loving the product featured! I will have to purchase some and try them out for sure! I have to show this to my wife. I can put on anything, and I’m fine. She has to be incredibly careful about what she put son her skin, though. I haven’t seen this brand of skincare products before. I like that it has no harsh chemicals. This sounds like a wonderful product line. I will have to check it out. I have really sensitive skin! I have never heard of this line of facial care before but I guess it is worth a try. My skin gets sensitive with the changing of seasons and I end up having breakouts or really dry skin. I like that these products instantly hydrate while cleaning. That’s awesome. I’ve heard this brand before and I really want to try, according to my friend, it’s really good on skin. These are great tips! My skin is super sensitive right now coming off of winter! Love this!! I was looking for good skin care products for my sensitive skin. I think these are worth a try! This is such a hot topic these days. I think with all the UV light (especially with approaching Spring), proper skin care is as important as ever. I haven’t used this brand before, but it definitely sounds like something I would try out. Thanks so much for sharing about this. I have such sensitive skin and a lot of allergies, so I have to be super careful with what I use on my skin. I’ve heard amazing things about Simple! My skin is SO sensitive. I have to be very careful and spot test everything. I will definitely check out Simple! Good tip on not touching your face. I tell my kids that one all of the time! I love this brand. It is such a great one. With super sensitive skin that gets worse in the winter it can be hard to find something that works without making things worse. Simple Skincare sounds like just what my skin needs. I am definitely going to get some to try this week. My skin is so dry and I want to have soft summer skin. VERY good tips! We have the Simple cleansing clothes around here and use them every day! 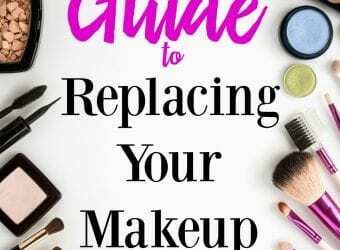 I know my friend uses Simple to remove her makeup – it’s part of her nightly regimen. I must agree, it’s so hard treating and caring for sensitive skin. It always takes the right products to make sure nothing happens to our fragile epidermis. Hydration, hydration, hydration! 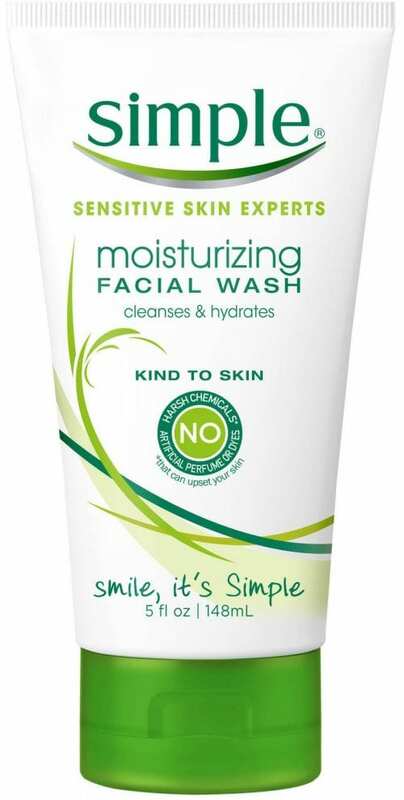 That really is the number one rule for sensitive skin. It can’t be stressed enough. My youngest has really sensitive skin. Even washing her face with the wrong product can cause a rash. Need to share these with her. I’ve been seeing these products floating around Target. I’ll have to grab one next time! This looks like a great line of products. I would love to try the facial wash. I have such bad reactions to certain things so anything made for sensitive skin is best for me. I am always interest in hearing more tips. Simple is a great brand of products. I would love to try these out sometime. I’ve never tried any cleansing water before. Interesting! And I think that’s what my face needs. 🙂 I would love to try that one. I like having products for sensitive skin at hand especially for Spring during Allergy Season! I also really love Micellar water, I haven’t tried this brand yet, but I can say it really does work well for me especially when removing makeup. Agree with all of the above! It can be really hard to take care of a sensitive skin. I usually find different skincare products on the Beauty Insiders. I don’t think Simple contains any fragrance and would be great for sensitive skin.